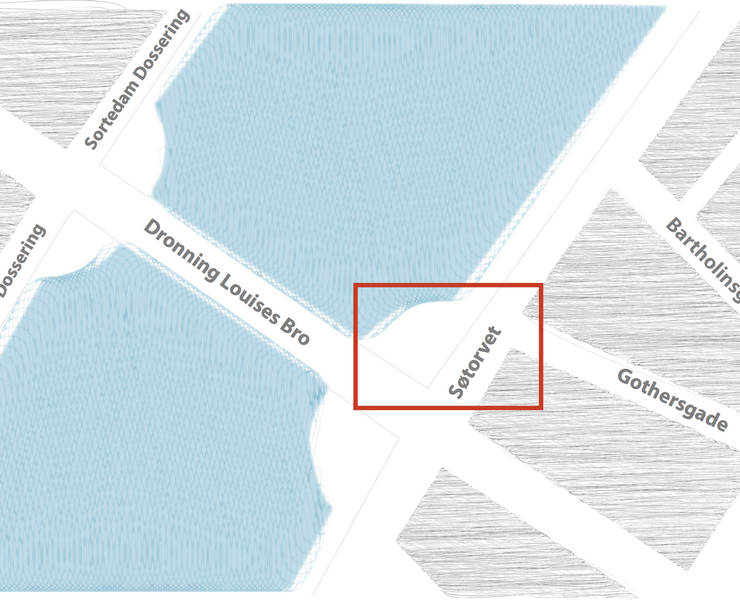 For the next study in our Desire Line series we have picked a renowned Copenhagen bicycle hotspot: the Søtorvet / Dronning Louise’s Bro intersection. Over 40,000 bicycle trips are made through this intersection at a daily basis, making it one of the busiest in the world in terms of cyclist volume. Such numbers create a special need for appropriate bicycle infrastructure in order to accommodate the bicycle users crossing this point. At Copenhagenize Design Company we have asked ourselves how we can determine the actual needs of bicycle users, and what solutions would be appropriate. This quest requires a greater understanding of the relationship between urban infrastructure and cyclist behavior, which is why we have conducted a Desire Line Analysis of this intersection. This study was conducted in collaboration with eight students from 4Cities, an international Urban Studies Master’s programme. Eight great and passionate students who tackled this analysis with professionalism. Lorena Axinte (Romania), Jamie Furlong (United Kingdom), Elina Kränzle (Germany), William Otchere-Darko (Ghana), Lucie Rosset (Switzerland), Guillén Torres (Mexico), Mäelys Waiengnier (Belgium) and Devon Willis (Canada). In order to identify how cyclists interact with infrastructure, and with other cyclists and road users, the students positioned a video camera and a few observers at the intersection between the hours 7:00 and 19:00 on a day in November 2014. One particular spot in the intersection is the center of attention for this study. When cyclists approach the intersection, coming from North East along Søtorvet and want to turn right onto Dronning Louises Bro, they tend to either ‘cut’ the corner by riding onto the pedestrian zone, or run a red light when turning right. At Copenhagenize Design Co. we are interested in digging deeper into this behavioral pattern and understand the scale of, and reason behind the exhibited behavior. Knowing how and why bicycle users consistently choose particular routes and strategies can help us understand priorities and motivations of bicycle users and inform our solutions - design-wise and political - in order to better accommodate their needs while paying mind to other road users as well. At Copenhagenize Design Company, we have developed a method for determining how bicycle users actually navigate within the built environment and what routes they choose to take in various situations. This method we call Desire Line Analysis. By observing a bicycle user’s trajectory through a course of a road, we can determine the most traveled through routes - their desire lines. Desire lines are the easiest and most convenient ways of getting from point a to point b for bicycle users, and conceptually they should be distinguished from actual infrastructure with its pre-established paths. Desire lines might correspond with pre-established paths, but sometimes they don’t, and this is where they reveal flaws in the infrastructure that at the same time create opportunities for improvements. Based on our video footage we identified the cyclists’ desire lines, first by tracking their point of departure - Øster Søgade or Gothersgade - and then by observing their destination - straight ahead, or right onto Dronning Louises Bro. 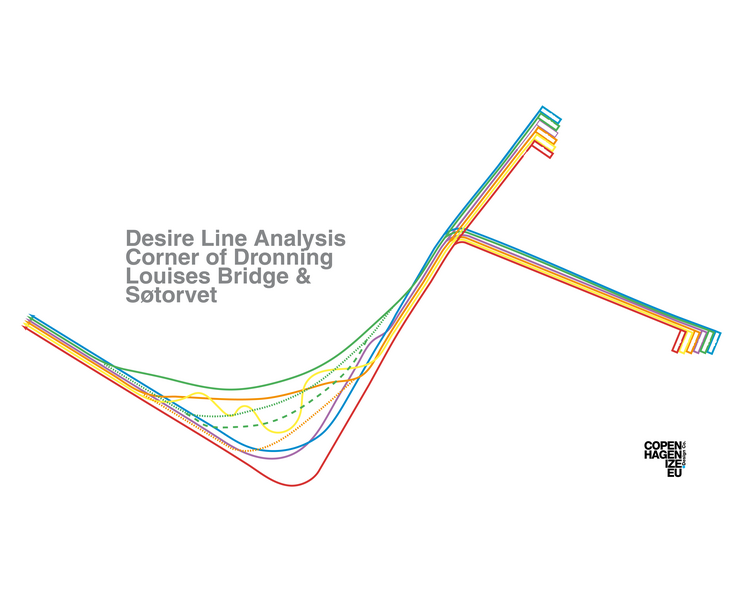 However, in this Desire Line study our main focus is on those cyclists turning right. We discovered six general desire line categories that cyclists use when turning right onto Dronning Louises Bro. 1. Following the official bike path - this desire line accounts for cyclists who turn right when the traffic lights are either green or red. All other desire lines below are drawn by cyclists that “cut”, i.e. they ride from the bicycle path up onto the sidewalk, cutting the intersection in order to arrive at Dronning Louises’ Bro. 2. Avoid the pedestrians - cyclists who zigzag or change their path in order to avoid pedestrians. 5. Cut right away - cyclists that cut the sidewalk as early as they can, without trying to follow the path. 6. Cut last minute - cyclists who cut just as they arrived at the red light. (we suspect that when being confronted with a red light, people prefer riding on the sidewalk rather than waiting at for the light to change). The question of what motivates people to cut the corner in order to arrive at the bike lane on Dronning Louises Bro is central to this study. In order to get closer to an explanation, we will first distinguish between cyclists who cut when traffic lights are red, and those who cut during a green light - where they could just as well have followed the bike path without stopping. The first group - cyclists who cut the corner during a red light - is the largest of the two. In particular, cyclists coming from Gothersgade, arriving on Øster Søgade, then turning right, were more prone to cutting the corner when the light was red. This is probably because they most often arrive at a red light in the intersection. Traffic lights in this area are timed to provide cyclists coming a different direction - Øster Søgade via Fredens Bro - with constant green lights that follow the speed of the average cyclist - the so called ‘green wave’. This, however, means that cyclists coming from Gothersgade will have their momentum disrupted when they arrive at the Dronning Louises Bro/Øster Søgade intersection. Thus, using the wide sidewalk as a quick way to avoid waiting for the lights to change can be tempting. The second group - cyclists who cut the corner while traffic lights were green - most often did so when there was a considerable number of cyclists in front of them, causing a queue for either turning right or continuing straight ahead. Such a situation creates an incentive to improvise a shortcut by riding across the sidewalk to get to Dronning Louises Bro. During the twelve hours we spent observing the intersection, only a few cyclist-pedestrian conflicts occurred. We are convinced that the considerable width of the sidewalk plays an important role here, since it leaves enough space for both pedestrians and cyclists to navigate around each other. We also found that of all the cyclists travelling through the intersection (i.e. those who went straight along Øster Søgade and those who turned right onto Dronning Louises Bro), the majority acted “correctly” (i.e. they did not cut or go through a red light, but rather followed the traffic laws correctly). During midday (11:30- 13:30), 72% of cyclists acted correctly (following the traffic laws) and only 28% acted incorrectly or inappropriately (going through a red light or cutting). Similarly, during rush hour (15:30-17:30), 76% acted correctly and only 24% acting incorrectly. This means that on average 74% followed the traffic law, meaning that they respected red lights and stayed on the bike path instead of cutting the corner. The remaining 26% performed some form of law breaking act. However, during the morning rush hour, an average of 50% cyclists either cut through the sidewalk or jumped the red light, when heading towards Nørrebrogade from Øster Søgade. 58% were male and 42% were female. While on average most cyclists acted correctly (74%), when looking at right-turning cyclists exclusively, the difference between those who followed the rules and those who didn’t, was less significant. Among cyclists who turned right onto Dronning Louises Bro, 52% acted correctly, while 48% acted incorrectly. Of those acting incorrectly, 35% went through the red light and 65% cut through the sidewalk. This ‘improper behavior’ might be connected to a phenomenon we have observed before; the so-called ‘domino effect’ where the actions and routes taken by one cyclist is copied by other cyclists behind him or her. In this sense a specific action legitimizes or inspires other cyclists to perform similar actions. For example, we noticed that once a cyclist is cutting, others start to follow suit. Conversely, when none in the front of the line cuts, the cyclists queueing behind also tend to stay in the group. In the early afternoon (13:30-15:30), many more cyclists acted incorrectly, an average of 68% cut or went through a red light, as opposed to a daily average of 48%. We suspect that this is because there are much fewer cyclists, cars and pedestrians on the road during this time of the day, and thus it is easier for cyclists to cut the intersection or slipping through a red light in a safer way, without getting noticed as much. Only 16% of all the cyclists we observed went through a red light (i.e. actually going through the red light on the bicycle path, not by cutting). Although the average is quite low, as mentioned above, larger numbers of cyclists were going through the red light at certain points of the day: in the late morning (9:30-11:30) an average of 27% of cyclists coming from Gothersgade went through the red light, and in the early afternoon (13:30-15:30) an average of 41% of cyclists coming from this street went through the red light. Again, it seems like cyclists are more likely to run a red light in between rush hours. In fact, only 3% of cyclists went through the red light from Gothersgade during rush hour. This observation supports our theory that a higher volume of road users creates a lesser incentive for cyclists to go through a red light. Our study confirms findings generated in previous desire line studies, showing how bicycle users create routes based on what is faster and most convenient, regardless of whether appropriate infrastructure is there or not. Although it sometimes means that bicycle users will follow the informal lead of other cyclists, and circumvent traffic rules in order to get to their destination, considerations regarding safety and/or public shaming do appear to inform their decision making. Only 1:4 of the total number of bicycle users we observed actually broke the law. When they did cut the corner, they strategically picked different routes through the pedestrian zone in order not to collide with each other, and only very few conflicts between cyclists and pedestrians occurred. To make a long story short, bicycle users are motivated to keep momentum going, and depending on the circumstances, some are ready to circumvent formal rules and collectively improvise their own in order to make their travel easier, if existing infrastructure does not accommodate their needs. So where should we go from here? Depending on the priorities of city authorities, different approaches could be used to mitigate the percieved ‘improper cyclist behavior’ in this intersection. Considering the volume of bicycle traffic, the most obvious retrofit would be creating a cycle track in an arc across the corner to allow cyclists to turn right unimpeded by traffic lights. A similar solution is already in place on the opposite corner, leading cyclists across a sidewalk to Vendersgade from Nørrebrogade. As we understand it, one department in the City of Copenhagen would be against this - worried about protecting the architectural integrity of the location. This is rather silly, considering the fact the City had plans to rip out of the grassy knolls formed by WW2 bunkers, cut down the trees and sanitize the whole area. That idea died, fortunately, but it is clearly a sign that change can happen at this location. The basic fact at this location is that the majority of cyclists are turning right and the minority are heading parallel to The Lakes. Desire Lines are democracy in motion. People voting, as it were, with their feet and bicycle wheels. As we found from the research, the main reason for cutting the corner or going through the red light is that cyclists coming from Gothersgade are trying to bypass the red light and simply maintaining their momentum. Especially in the busy rush hour it would be beneficial to time the traffic lights for cyclists coming from Gothersgade so that they continue in a smooth flow up Nørrebrogade. Maintaining, respecting and legitimizing the momentum that cyclists need would eliminate the need for cutting the corner. It is with good reason that allowing right turns on red is steadily becoming law all over Europe. Making this the default at this intersection would also impact the behaviour positively. It is not the be all, end all solution at this location however. The wide swath of sidewalk is currently a kind of “shared space” that works well at this location. Making the area shared use would require little physical change and would formalise the behaviour of the cyclists. A fun idea, but it is important to maintain a design standard and throwing a mixed use area into the well-functioning infrastructure design tradition may not be a good, permanent solution. If you wish to read the entire report on this study please go to our company website. It's downloadable from there.